Stand a chance to win one of five R200 betting vouchers in our latest Same Match Betbuilder promotion which gets underway on Thursday 13 September! This competition will run from Thursday, 13 September 2018 at 00:00am – Monday, 17 September 2018 at 23:59pm. Entries must be received by 23:59 on Sunday 117 September 2018 (the “Closing Date”). Hollywoodbets accepts no responsibility for any entries that are incomplete, illegible, corrupted or fail to reach Hollywoodbets by the relevant closing date for any reason. Proof of posting or sending is not proof of receipt. Automatically generated entries or entries via agents or third parties are invalid and shall not be considered. 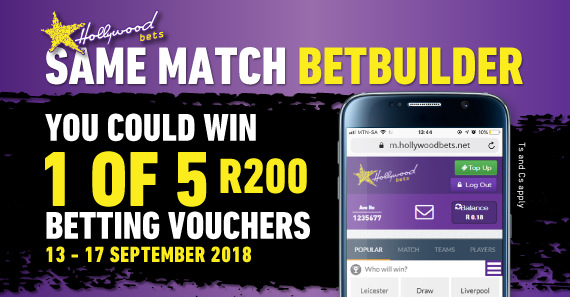 To enter the competition, the contestant must take a bet using the Hollywoodbets Same Match Bet Builder online betting service between the promotional dates. No cash bets allowed. The prizes will be 5 x R200 betting vouchers. The winners will be announced on Tuesday 18 September 2018 at 12:00pm. Winners must be 18 years or older and have a FICA approved Hollywoodbets account. This competition is not open to employees of Hollywoodbets , Racing Distribution, Winning Media or Star Merchant employees as well as employees of Hollywoodbets managed entities or related affiliate companies. Companies in the Hollywood Sportsbook Group are licensed betting operators. Hollywoodbets supports responsible gambling. No persons under the age of 18 years are permitted to gamble. Winners know when to stop. National Gambling toll-free counselling line 0800 006 008.